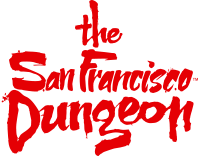 For safety reasons we can only accept ONE (1) wheelchair user per tour group and only three (3) wheelchair users within the San Francisco Dungeon at any given time. Tour groups depart every eight (8) minutes so for large groups of wheelchair users please contact us for information on how we can assist you with booking your group. We would advise booking your visit in advance as wheelchair users without an advanced booking may need to wait a considerable time to start the tour or not be able to gain admission if we are fully booked.